Gluten is a sticky protein found in barley, wheat and rye. It’s the component that holds together pasta, makes bread rise and the pizza dough to stretch. Most people can tolerate this protein but it causes a severe immune reaction when taken by people with celiac disease. If a person suffering from celiac eats foods containing gluten, the lining of their small intestines are destroyed by the protein, making it impossible to absorb nutrients. The person experiences several symptoms, such as fatigue, abdominal pain, diarrhea, muscle cramps, skin rash and depression. It is imperative for people with celiac to follow a gluten free diet to avoid any damage to their intestines. The obvious foods that contain gluten are those made from wheat flour, such as crackers, cookies, bread, pasta, pizza, candies, cakes and doughnuts. Gluten is also found in other sources that are less obvious, such as salad dressings, candy, beer, soy sauce, processed soups and sauces, spice blends, rice mixes, canned items, ice cream, malt vinegar, processed juices, jelly beans, popsicles, Play-Doh and flavored milk. Most processed foods contain gluten as well as nutritional supplements, vitamins and even soaps, certain lipsticks, shampoos and medicine. Gluten may be hidden in food labels as modified food starch, emulsifiers, caramel color, malt, lecithins, MSG or soy sauce. Gluten may be labeled as the natural flavoring in most food items. It is always good to confirm whether this natural flavoring is gluten free. There are many foods that people on a gluten-free diet can safely consume without any worries. These include all rice varieties, such as basmati, Arborio and jamine and all vegetables ranging from broccoli, spinach, amaranth, carrots and cabbage. Other foods include cereals and legumes, such as lentils, beans, haricot, black beans, chick peas, cow peas, peas among others. Quinoa, corn, millet, sorghum, polenta, buckwheat and tapioca are also safe. Tubers, such as Irish potatoes, sweet potatoes, arrowroots, yams and cassava are gluten free as well. Unprocessed poultry, pork and beef meat, fish, seafood, most cheese, yogurt and butter as well as eggs and milk are also safe. Nutrition bars are a great supplement of a healthy lifestyle, providing people with energy and nutrients when they do not have time to eat a meal. 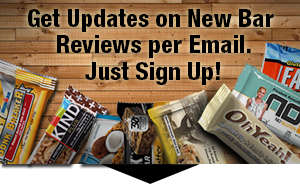 Manufacturers of gluten-free protein bars are getting more gluten conscious and reformulate some of their recipes to eliminate gluten in their products. Those on a gluten-free diet can snack on these bars to enhance their protein intake. Most beers are malt-based so they contain gluten, unless they are labeled as gluten-free. Wines, liquors and ciders are safe although it always good to double-check the components. Distilled liquor is always safe unless it was flavored after the process. Read the label carefully or call the manufacturer to ask whether the flavoring contains gluten, if it’s not clearly stated on the packaging. People on a gluten free diet must read the labels of all food items carefully before making any purchases. Just because an item is labeled as wheat-free doesn’t mean that it is gluten free. It might contain some of the hidden gluten in form of flavoring or coloring. In the U.S., manufacturers are required by the law to disclose wheat in the ingredients list. However, this rule does not apply to foods from other countries. There are also many gluten-free products in the market, such as those from General Mills, Unilever, Hain-Celestial, Kraft and McCormick. These products are more expensive compared to others. In major cities, there are also bakeries and specialty stores that are exclusively gluten-free or have a section. Powered by ultra-pure, premium-grade WHEY protein blend with no artificial growth hormones and No Soy Ingredients, NuGO STRONGER sports protein bars represent the ultimate combination of outrageous flavor and function. NuGO STRONGER is Lower Sugar (no sugar alcohol Maltitol), Gluten-Free, Non-GMO and packed with 25g of a premium-grade protein blend, powered by high-quality rBGH-free whey protein. INGREDIENTS: Protein Blend** [Whey Protein Concentrate, Rice Protein Crisp (Rice Protein Concentrate, Brown Rice), Milk Protein Concentrate, Rice Protein Concentrate], Coating* (Palm Kernel Oil, Inulin, Cane Sugar, Whole Milk Powder, Whey Protein, Alkalized Cocoa, Cocoa Powder, Salt, Vanilla), Caramel* (Fructooligosaccharides, Palm Kernel Oil, Cane Sugar, Water, Non-Fat Dry Milk, Glycerine, Sunflower Lecithin, Salt, Sodium Citrate, Natural Flavors), Glycerine, Tapioca Syrup, Peanuts, Chicory Root Fiber, Organic Agave Syrup, Chocolate Liquor, Almonds, Natural Flavors, Canola Oil, Salt. Allergen Statement: Contains Peanut, Almond and Milk. 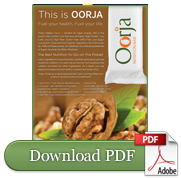 Manufactured on equipment that also processes products containing tree nuts, soy and egg. 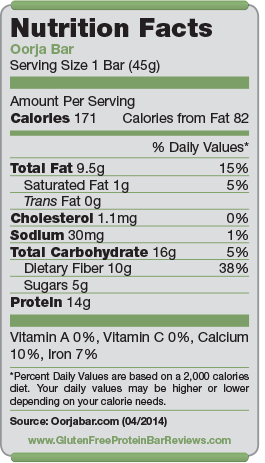 Nutrition facts based on Peanut Cluster flavor. Facts and ingredients vary by flavor. NuGo believes that pure, natural ingredients are both better for you and better tasting. From our very first bar to the latest, we’ve maintained a commitment to creating great snacks without taking shortcuts. Our bars are full of the protein that every diet needs. In response to our consumers’ diverse needs, NuGo has created many lines of bars: Family, Organic, Dark, FREE, Slim, Stronger, Smarte Carb and Crispy Cat. In keeping with NuGo’s core principles, we don’t use hydrogenated oils, trans fats, or vegetable fat compounds instead of REAL Chocolate. Brown rice and REAL Chocolate are combined to create a texture that’s crisp and delicious. We never use high fructose corn syrup. The sweet and salty Caramel Pretzel is by far the favorite flavor according to many buyers, followed up by Peanut Cluster, which tastes just like a Snickers bar. But with a lot more protein and less sugar. Thick, chewy, dense and rich were how buyers described the bars. The Cookies N Cream can be a bit dry compared to the other flavors. 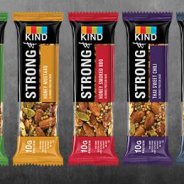 Buyers really liked that these bars are made with hormone-free whey protein and non-GMO ingredients. It also is both high in protein and fiber. 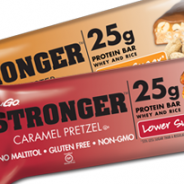 However, some buyers complained that they got gas after eating NuGo Stronger bars. We wish it wouldn’t use palm kernel oil for the chocolate coating. There are no artificial sweeteners and no sugar alcohols either. With bars in this protein category, the price always seems a bit high. But compared to other bars, the NuGo bar is actually a little bit less expensive for that amount of protein. 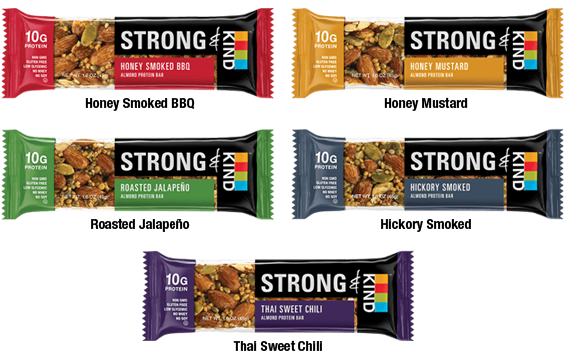 Strong & KIND Bars are made from 100% whole ingredients: almonds, pumpkin & hemp seeds, pea crisps and spices, delivering 10g’s of protein per bar. 22% of each bar is protein, and because it’s from a combination of legumes, nuts and seeds, it contains all 9 essential amino acids. Pea protein is an easily-digestible, non-GMO source of plant-based protein derived from peas. INGREDIENTS: Almonds, pumpkin seeds, honey, non GMO glucose, pea crisp (pea protein isolate, rice flour, rice starch), hemp seeds, tomato powder, sea salt, spices (cayenne chili, black pepper, clove, cinnamon), sunflower lecithin, garlic powder, distilled vinegar, molasses, natural smoke flavor, mustard seed, citric acid. Allergen Statement: Contains almonds. May contain nut shell fragments. Nutrition facts based on Honey Smoked BBQ flavor. Facts and ingredients vary by flavor. 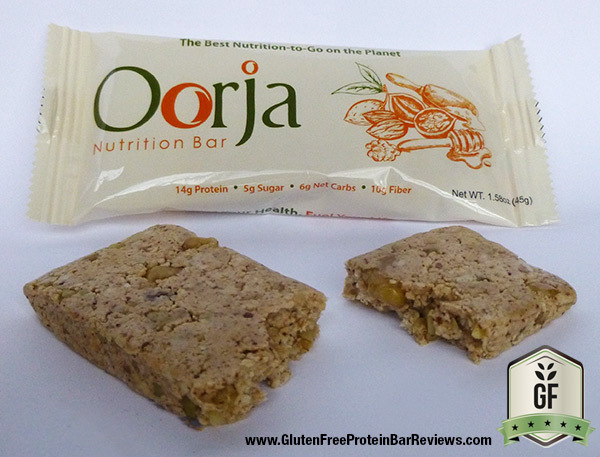 Brand new to the gluten free market is the Oorja Bar – a non-GMO bar with only six ingredients. 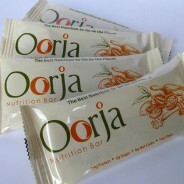 Thank you Oorja for sending us a box to test the bar. You can read our personal review in the comments section. The official review however won’t be included in the ratings until we find the first few reviews from other buyers online. INGREDIENTS: Whey Protein Isolate, Chicory Root Fiber, Organic Almond Butter, Organic Walnuts, Organic Clover Honey, Cinnamon. Allergen Statement: Contains tree nuts, milk. May contain traces of peanuts, egg, soy, wheat. The key question is how to get the most bang out of least number of natural ingredients without sacrificing quality? With Oorja, we believe we have answered that question fulfillingly. Every ingredient in Oorja has been carefully selected to provide maximum nutrition in a razor focus manner that balances the nutrition provided by other ingredients. As a result, you are assured wholesome and healthy nourishment every time.